I wrote this piece some years ago when I was writing my book, Heroines on Horseback, and struggling to complete the chapter on Ruby Ferguson and the Jill books. I am a grade A prevaricator, and like to prevaricate by researching anything other than what I'm supposed to be working on. 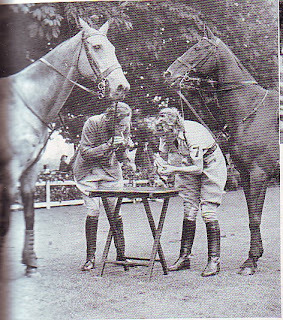 I'd just bought a collection of Riding Magazines from the 1930s, and they provided rich, rich fodder for prevarication. 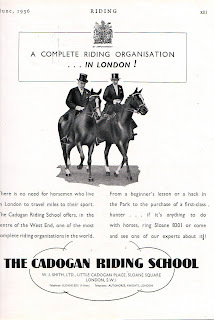 I wrote an earlier post on the Cadogan Riding School and what happened to it in the Second World War, and you can find that post here. I have now finished my accounts, Holiday Club is behind me and I have therefore nothing to prevaricate about at all and no reason whatsoever for not getting on with wrestling some sense into my great thoughts about Ruby Ferguson, but like a horse turned out to pasture for the first time in the spring the freedom from duty has gone to my head, and my head has turned to the Cadogan Riding School, about which it wishes to know more. The lions were gloriously unzipped in the spectacularly unseasonable April heat. My husband asked me how I got the background to the picture of the monkey. I have no idea. The picture was taken through a coach window: the monkey was about to leap up to the coach wing mirror. I did wonder what the attrition rate was for the monkeys, who despite their extraordinary athleticism treat moving cars with no respect at all. It must be a good 40 years since I was last at Woburn and now everywhere has sprouted those hand cleaning dispensers you get in hospitals. My little group of children were distinctly sniffy about the idea of washing their hands before they went in until I told them the idea was to protect the animals from them, not the other way round. They then attacked the dispensers with verve every chance they got. Interesting. There are times I'm glad I'm a morning person. Review: Janet Rising, Pony Rebellion and Stables S.O.S. Thanks to Janet Rising for sending me Pony Rebellion. Stables S.O.S. I bought myself from a real, live shop. 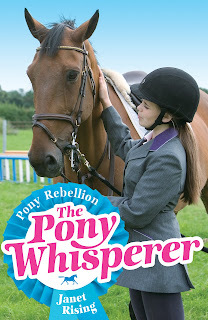 Pony Rebellion, book 5 in the series, sees Pia and her friends putting together a musical activity ride in aid of Riding for the Disabled. This involves practice. Lots and lots of practice. Unfortunately the ponies get very fed up with all this practice; so much so that they go on strike. Nothing Pia tries, despite her ability to talk to the ponies, will make any difference to the ponies’ decision. The Hackney Horse isn't the most common of British breeds; it and the Hackney Pony are now on the Rare Breed Survival Trust's Endangered list, which means there are between 300-500 adult breeding mares left. The Hackney, like the even more endangered Cleveland Bay, has presumably lost popularity as carriage driving became a sport rather than a mode of transport. Here's some film of when there were rather more of them about. Christina Wilsdon remembers time and model horses gone by. Presumably these horses were sold in nice dry weather. Pony Book Chronicles takes time off from books to contemplate gardening. Day lilies might be thugs over there, but in my garden they are tender sensitive souls, who shy prettily away from the idea of flourishing and then wither away to nothing. Stephen Foster writes about the appeal of the book rainbow. and just one dozen riding lessons, they cleared ooh, say 5 feet? Who needs Photoshop? This ad appeared in the Christmas 1931 review of The Institute of the Horse, one of the precursors of the British Horse Society. 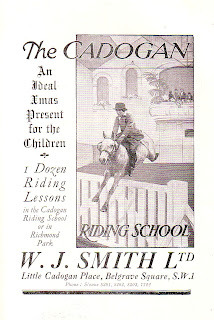 I don't know if the riding school portrayed actually was the Cadogan Riding School. If it was, it was ferociously glam. It reminds me of the glorious Marshall Street Baths in Soho, where I used to swim when I worked in the West End. It always felt like swimming in a ballroom – not that I ever have swum in a ballroom or indeed been in a ballroom at all as far as I can remember, but it was a world away from your average municipal bath. Girls Gone By’s republication of Monica Edwards continues with the re-issue of this Punchbowl Farm story, together with the usual extras which make this book well worth buying. Already out in the USA, Ravenspeak is due out in April 2011 in the UK. For those who haven’t yet read her, Diane Lee Wilson writes excellent historical stories in which her characters and their horses try and make sense of their world. Ravenspeak is the story of Asa, daughter of a Viking chief. The clan is in the grip of a vicious winter, and most of the menfolk sail away to find food. Jorgen, the wise man who is left behind, wants to eat Asa’s beloved horse (which bearing in mind there is no food seems not entirely unreasonable) and to take over the clan while Asa’s father is away. If you don't fancy either the cigarette race or polocrosse in the Easter Holidays, and you have no exams to cram for, then you could always try playing soliders, which Riding Magazine suggested in August 1936 as something for the Pony Club to do "when the weather is too hot and ponies too fat to take .. strenuous exercise." As a child I'd have looked on this and blenched not at all, but as a mother, I'd have gulped a bit at the thought of my darling attempting the tandem driving (the leader was previously trained on foot, but still ... ) I wouldn't have fancied holding the hoop either if it all went wrong. As for the surfboard, maybe the riders' descendants are now horse surfing. Alas the author of the piece, Gwen M Parry, doesn't mention which branch of the Pony Club this is. If anyone has any idea please let me know. The branch shown had just got back from Belfast, where they did a display at the Royal Ulster Show. I posted earlier about Polocrosse - an early variation on polo which is, as its name suggests, a cross between lacrosse and polo. I didn't go to a lacrosse school so my only exposure to the game was reading about it in Enid Blyton's school stories, where it took on a sort of mystical fascination as some daring and glamorous game. Had I actually come across lacrosse I would probably have run a mile (or at least hidden in the changing rooms) - I was never keen on thundering around a field unless it was on a horse. Polocrosse was started in the UK at the National Equitation Centre in Roehampton: it's been played since the early 1930s. I recently found an article in Riding Magazine, December 1936 by "AP" describing the game as "intended to amuse children and give them confidence handling their ponies," which the riders in the clip below certainly have. It's a British Pathé clip of polocrosse in 1940. Are jodphurs bad for us? Apparently leggings are bad for us, making our muscles lazy. Well, not mine, because I never wear leggings, but I do wonder if a dependence on the fitted jodphur when young explains the less attractive aspects of my figure now. Will parents despairing at their daughters' horse mad state now hiss at them "all this jodphur-wearing will simply MAKE YOU A FLABBY DISASTER WHEN YOU ARE OLDER." Would make a change from rude remarks about eau-de-cheval and the unsocial qualities of a one subject discourse I suppose. With the proliferation of e-books, it is perhaps no surprise that illegal use would pop up sooner or later. Julia Donaldson, author of The Gruffalo, and many others, probably has the right idea in keeping her books firmly in the traditional format. Can't see this gymkhana game being given programme space in the Prince Philip Cup. This photograph shows Lady Margaret Drummond Hay and her partner "at a difficult stage of the bun-eating, water-drinking and cigarette lighting competition in the Ladies' Gymkhana at Ranelagh," sometime in 1936. This event was, strangely, absent from every pony book description of a gymkhana I ever read. I have now heard from Penguin, who say that these editions will be published in the UK late this year or early next. They do not have any internal illustrations, which is fair enough I suppose in the case of Emma. Penguin have commissioned artist Jillian Tamaki to produce three covers for its Penguin Threads edition, Black Beauty, Emma and The Secret Garden: whether we are going to get these in the UK I do not know. So far enquiries to Penguin have only produced a rather discouraging "out of office" email. I think these covers are stunning: I'm assuming that only cover illustrations are involved rather than a complete new edition, but still well worth getting, I think. It's the most exciting new cover for some while. I don't tend to photograph the less lovely bits of my walk, but here's the view over to the railway line. I'm wondering if this is a rhododendron or something less sinister. If it is a rhododendron, do I go and hoik it out, bearing in mind it might take over the hedgerow if left? and the temperature is just right for bathing. I wonder what the pigs would make of the stream were they able to get to it, but they seem intent on digging for victory. These stones, whose scale I haven't managed to convey entirely successfully despite the dog, are supposed to be the remains of a Medieval manor house. As the site is handy for the stream, and for this valley, reasonably well sheltered, it seems at least possible. The full shortlist is here: included is the excellent The Bride's Farewell, by Meg Rossoff, which has been in the to be reviewed pile longer than I care to think about. It is a fantastic read. and one at which I can only boggle, and hope I don't get sent a review copy. Or perhaps I do want a review copy. Who knows?